Jesus swept onto the scene declaring that the Kingdom of God had arrived! He proclaimed that we would experience life at its fullest only when we organize our lives around the Kingdom. E. Stanley Jones suggests that life in any other way is a muddled, maddening, and impossible way to live. Throughout the centuries we have lost the Kingdom as a clearly defined and workable system for order and influence in our daily lives. 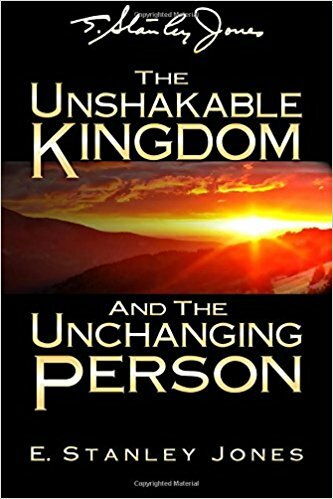 We have reduced the Kingdom by putting it into narrower molds, a refuge now, a present security, a future hope, anything but the Kingdom as Jesus preached it – God’s total answer to man’s total need now.” Dr. Jones shows us how to claim our spiritual heritage and the abundant life promised us by embracing the Kingdom and Person of Jesus. He suggests how our experience with God and His Kingdom should be taught and shared in the life of the individual, in the life of the church and in the nations of the world.